Looking for a place on the beach for next semester or next year? Beach living can be a great way to escape the stresses of campus and enjoy the beauty of the beach. However, there are a few things that are often overlooked when people consider living at the water. Maintaining your Academics! - Many people easily become distracted by the beach and the laid back attitude many people live with on the island. It's important to remember that if you are here for school, that should be your number one priority! Getting to Class - If you are taking classes on campus, it's imperative you understand what getting to class entails. This requires leaving early, which will ensure enough time to make it to campus if the bridge is up. The bridge usually goes up every hour on the hour, with the exception to commerical vessels, which are less frequent (one or twice a day). With no wait at the bridge, it takes an estimated 13 minutes to get to campus from the beach. Resisting the Urge - While living at a beach often feels like a 24/7 vacation, it's important to resist the urge to live as such. Just because there is at least one bar open every night of the week, doesn't mean you have to be there. Remember that one of the most important parts of stress management is living a healthy lifestyle. Keeping a Balance - While it is important to maintain focus, it's also important to not overlook what is right in front of you. The beauty of the ocean! Make it a point to take a walk on the beach every day, even when cooler weather comes. The loop at the park is also great for excerise and socialization. There are many races, such as the Turkey Trot, and events to be a part of right here on this track! Try getting involved in Sports. 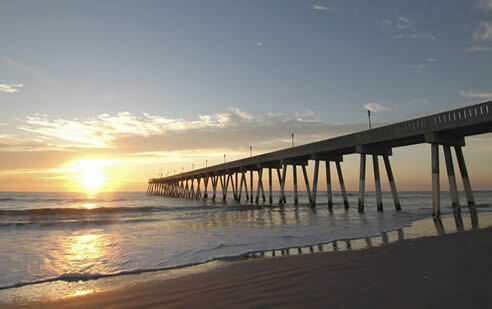 The park at Wrightsville Beach is a great place to engage is physical activity, and regular exercise is known to help the brain work more efficiently on school work. Another thing you'll have to try at the beach is fishing, spear fishing if your a risk taker. Check out the Wrightsville Beach Museum. You have to eat at Cause Way Cafe but dont spent all of you loans there.